NPA chief executive Zoe Davies tackles the issue of the Method of Production (MoP) labelling in the latest issue of Pig World. In her comment article, which can be read here, Zoe says: "The chatter about method of production labelling is increasing, too. What really irks me is the common assumption that outdoors must equal good, while indoors equals bad and this is exactly what method of production labelling would signal, intentionally or otherwise. "We’ve talked to retailers about how this should be more welfare outcome focused, but try as I might, I can’t think of a labelling system based on welfare outcomes that won’t lead back to system! "If anyone has any bright ideas please share, as we know retailers and politicians are already looking at it and I’d love to be able to give them a sensible alternative – preferably nothing to do with labels! "I think we should better explain the existing labels we have, but the rhetoric is out there now that the customer wants to know more, even if that isn’t true (which I suspect) it matters not – so we must have a solution." The article outlines why the subject of MoP labelling, driven by the Labelling Matters campaign, is in Defra Secretary Michael Gove's thoughts as the seeks to use Brexit to drive up welfare standards on Britain's farms. If we go down the MoP route, the industry would very much want its say on the terms. In the article, Zoe argued that production system should not be used to define welfare. If we go down the MoP route, ‘indoor bred’ would make a better indoor label, she said. She said the pig sector defined several different methods of production nine years ago as a voluntary scheme to help educate consumers. However, agreement on definitions for indoor-reared pork was never reached because of the plethora of indoor systems that exist. “The housing system does not define a pig’s welfare, which is the result of various factors, with stockmanship and veterinary care to the fore,” she said. 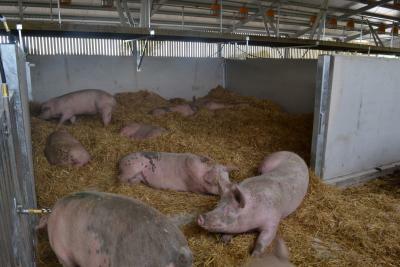 The UK pig sector is leading the way in ‘Real Welfare’ on-farm veterinary assessment of indicators, or outcomes, of pig welfare. The British Veterinary Association is backing the Labelling Matters campaign and has stated that mandatory MoP food labelling could offer post-Brexit UK food producers and farmers ‘a unique selling point’. But it stressed that: “A focus on welfare outcomes, not just inputs like housing, would help give a more accurate picture."